I’ve mentioned a time or two here that Mr. P and I have had to adjust our eating habits a little in our new city. Most of it has to do with adjusting to a new grocery store and what it keeps in stock. Kroger, you still have my heart... Schnucks is that new boyfriend who tries hard and usually makes you happy but still doesn’t realize how good the ex is. But the other reason we’ve had to adjust is prices. No matter what store we try in St. Louis, boneless chicken is expensive. In Nashville, boneless chicken was our main protein staple. We ate so much boneless chicken that it’s a wonder we didn’t start clucking. But at $5/pound here? No more clucking. Instead, we may be oinking. Because pork, inexplicably, is almost always super cheap. 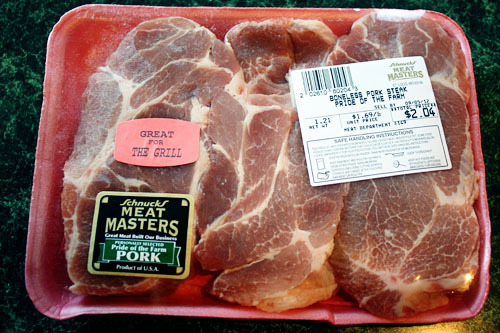 $1.69 a pound for pork steaks? Uh, yeah. I will make those work for us, sure. So, I’m constantly on the lookout for pork recipes that are more complex than “ask Mr. P to grill them”. It’s tricky because pork is – to me – a little less forgiving in terms of cooking style (soooo easy to under or over cook) and a little less flexible for flavors. Still, I’m determined to embrace this new porky lifestyle with new recipes! 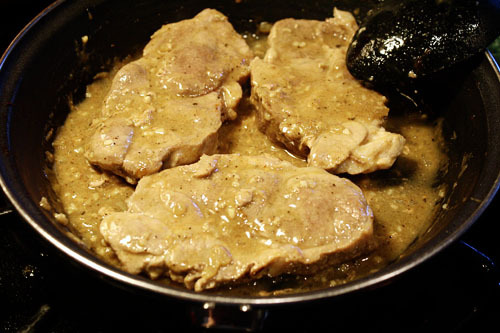 Which brings me to today’s inspiration recipe for braised pork chops. “Braised” sounds fancy, but all that means is that the meat is first seared at a high, dry temp, then slowly finished cooking in liquid. Your basic pot roast? That’s simply a braised chuck roast. 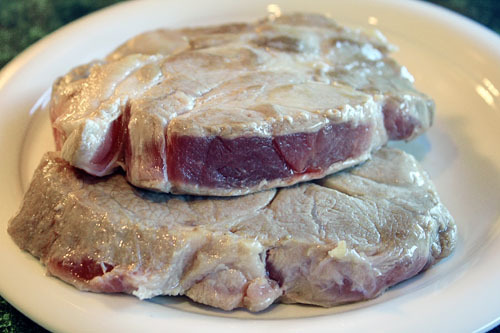 It’s particularly nice for tougher cuts of meat, which is good for pork steaks (they’re less expensive than pork chops, but also less tender). 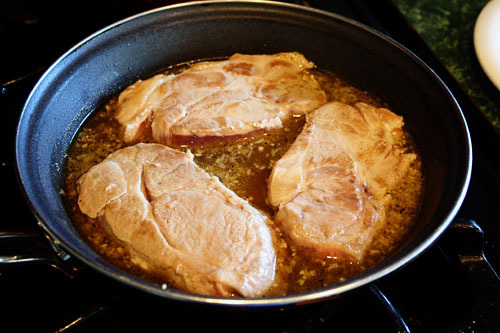 So, let’s get to braising these pork steaks! Start with the searing. I didn’t even bother seasoning these guys in advance; I just threw them in a pan with olive oil over medium-high heat. After just a minute or so on each side, I removed the steaks from the pan and let them rest while I prepared the sauce. Per usual, I didn’t really measure the amount for the braising liquid/sauce, but I think it’s hard to screw up. 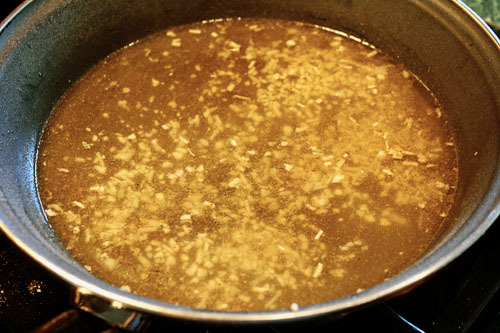 Add some white wine, some broth, some minced garlic (I use jarred), some minced onion (I use dried), some pepper, and perhaps a bit more salt if you use low-sodium broth like me. 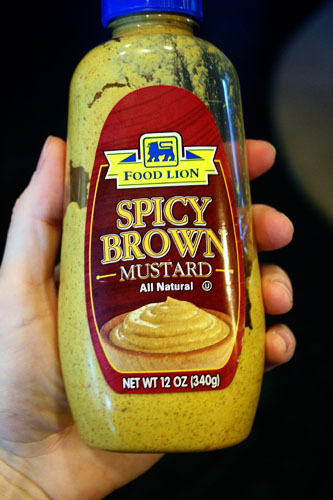 ... old spicy brown mustard from the cheap-o grocery store from our old house in Nashville? Grey Poupon, that is not. And now you cook. And cook and cook and flip them over and cook and cook. This is gonna take awhile, especially over low heat. 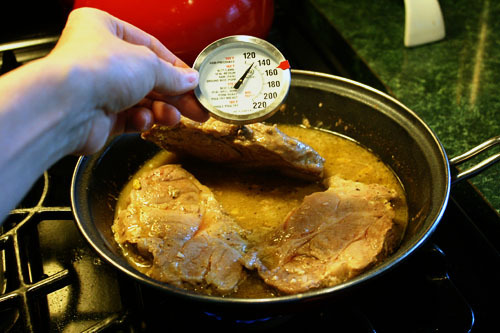 For pork, you gotta get the internal temperature up to 145 or 160 degrees Fahrenheit, depending on who you trust. I went with 160 this particular day, which took over a half-hour simmering on medium-high heat. Even after that, I still had a few pink spots. Considering the new guidelines sourced above, it was probably safe to eat, but pink meat grosses me out. So, be prepared for the long haul, cover the pan if you want, add liquid as needed (you want the pork at least halfway submerged). The lower and slower you can stand to cook it, the more tender the finished product will be, especially if you’re using steaks instead of chops. Try to be patient! In the meantime, make a side dish or something (I went with mashed potatoes, seen in the photo below). 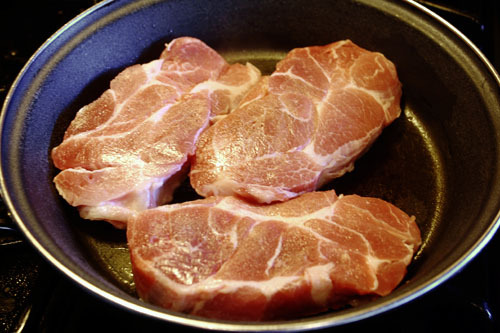 Once the pork hits the magical parasite-killing temperature, pull it out of the pan and set it aside, again. Add a little cornstarch-slurry (less than a tablespoon will do) if the liquid isn’t reducing or if you’re just impatient because you’ve been cooking for the better part of an hour geez louise. 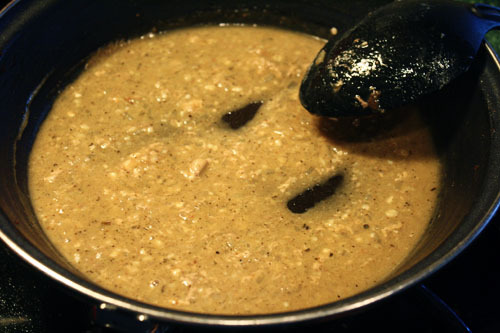 Soon enough, the liquid will cook down and thicken. And voila! A date-night-worthy dish! As I mentioned, I admit I had a bit of trouble balancing the slow cooking and low heat with keeping the meat tender AND cooking it all the way through. But with the help of a thermometer and lots of cheap pork for practicing, I think I’ll get it down soon enough! And if I learn any tips and tricks along the way, I’ll be sure to let you know. 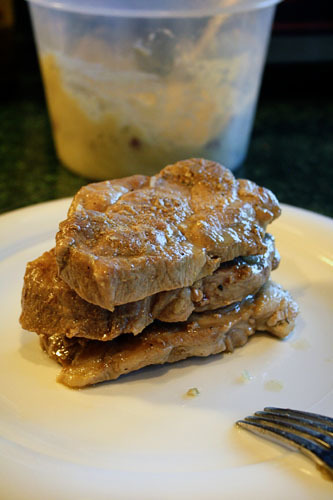 So there you have it, braised pork steaks! Doesn’t that sound fancy? 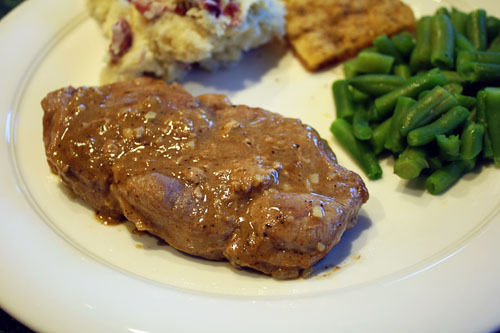 Yet it was made with inexpensive meat and pantry ingredients! If you’re lucky enough to live in a part of the country where chicken is cheap, you can braise chicken breasts and make the easy-peasy sauce for them, too. Enjoy! I really like the yet-another-incarnation of the desk!! Two dollars well-spent for sure! You may want to take another look and consider taking my $1 tea cart, too.